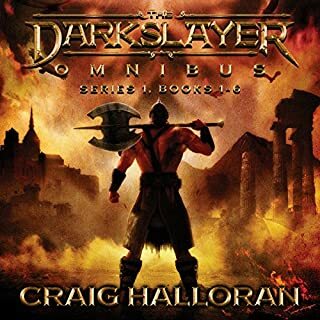 What made the experience of listening to The Chronicles of Dragon Collection: Series 1 Omnibus, Books 1-10 the most enjoyable? The story is good, and it moves along really well. At first its really non stop action, it almost feels forced. I guess the author was using battle type scenes as his tool for character development. About a 1/3 of the way through the book the characters split and start having different story lines. Nothing new there, but the switching back and forth happened to often for me. I understand why you switch scenes right before something is about to happen but it was literally every 3 to 4 minutes for a while, it was very distracting. This is a performance where there is lots of sound effects. It can be entertaining and add to the book, if done well. The sound effects where done well but when they where added into the recording during production the volume levels where not paid attention to. This over sight made the book really hard to listen to it would go from incredibly loud to barely being able to hear what someone is saying. 4.9 stars if i could rate it accurately! Want to see how the series continues but waiting for another book bundle of similar time length (50+ hrs). I drive OTR and selecting the next title in a series doesnt do me any good when im trying to liisten and negotiate traffic at the same time. worth losing a few nights sleep over! starts off a little slow and was wondering if it worth my while, then it picks up and now, wow is all I can say! At first I thought I wouldn't like it. The story was a bit childish but I am a kid at heart. The story is predictable and sometimes silly. Characters are fun. The ten books together seemed long but we at least got to a respectable and expected ending. not a finished storyline. cant wait for another book. still need a couple more words. The book may have been good but I couldn't get through it because of Lee Alan's voice. His character changes all sound like whiney little girls. I loved how the moral lessons were easy to pick out, even for the younger kids, but it was still entertaining for the adults. I applaud how there was not a shred of identity politics forced into the narrative. —-just good ol adventure. 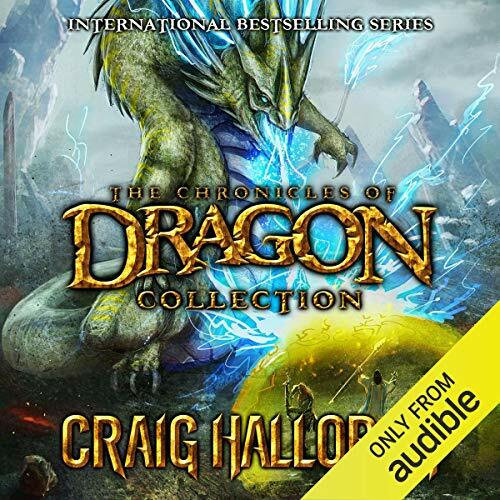 Would you consider the audio edition of The Chronicles of Dragon Collection: Series 1 Omnibus, Books 1-10 to be better than the print version? Equal, I love to read, however, I can share with my children this audio version. Nath Dragon. He went through a lot of growing and being tested. He remained true and loyal which teach right from wrong. I like the roamer elves. Shum and Hoven. I liked all of the different types of dragons that they encountered. No. However, I like his voice. There is a lot of humor in the book which caused bursts of laughter. There are sad parts in the book which made me worry about the characters. I liked the fact that the content is appropriate for all ages and I was able to share with the readers in my family. 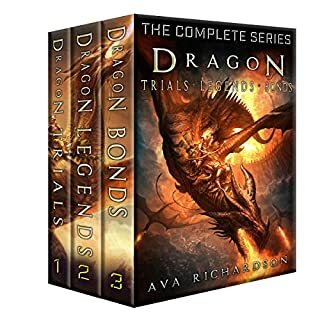 What disappointed you about The Chronicles of Dragon Collection: Series 1 Omnibus, Books 1-10? 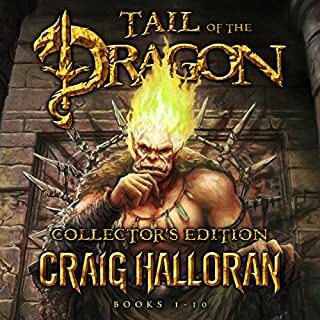 What was most disappointing about Craig Halloran’s story? If you could play editor, what scene or scenes would you have cut from The Chronicles of Dragon Collection: Series 1 Omnibus, Books 1-10? Well I lasted 20 minute of this book, and I'll explain why. Picture the scene you are 8 years old and playing D&D for the 1st time, the DM starts to tell you a story and has a whole range of sound effect from bolts being shot from a crossbow, heavy breathing of main character running, to crickets chirping in the night, that’s how this book comes across, and all this in 20 mins of story starting. 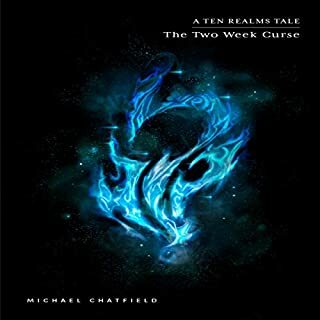 If you are a serious fantasy reader/listener and love the depth and complexity that many authors are able to create with just words alone i.e. 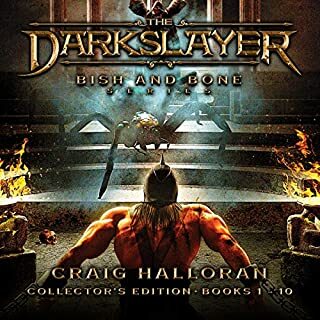 Brandon Sanderson and the Stormlight archives series – the near constant sound effects, and music in chronicles of the dragon will drive you nuts. ...and a bit disappointed. The quality of the recording is, well, odd. There is the narrator speaking in your ear, and then the characters who sound like they are in a pillow case about 20 feet away. Just bizarre. And - judging on length of this book - I thought it would be an adult fantasy book... Perhaps in the Terry pratchet style, or Tolkien. But no. This seems to be aimed at the same crowd as the Twilight series, except I can't imagine a teen having the patience for a 50 hour book? Anyway it's not great, but it's OK. Get it with a credit, don't buy it. Too many sound effects and tried way too hard. I seem to have fallen into the same trap as some of the previous reviewers. Saw a 50 hour book and assumed it would be for adult reading. Boy was I wrong from the first minute with the sound effects the wailing the panting as the character runs I was turned off. Half the enjoyment of reading or listening to a book is that you as the audience/reader create the story in your head with some imagination. 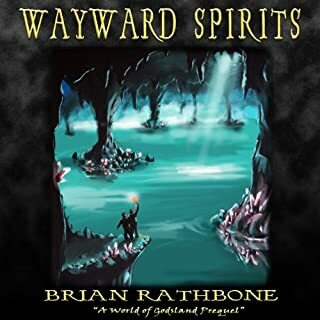 This "audio book", and I use the term lightly because it is more of an audio play like they have on the radio, takes half the fun out of reading in my eyes. I did not enjoy this book because of all the noise. the story was ok. I would possibly recommend it to a child/parent as my kids (pre-teens) enjoyed it, personally I found it irritating with the idiotic sound effects and voices always in the background. FANTASTIC BOOK LOVED EVERY MINUTE. If you could sum up The Chronicles of Dragon Collection: Series 1 Omnibus, Books 1-10 in three words, what would they be? What was one of the most memorable moments of The Chronicles of Dragon Collection: Series 1 Omnibus, Books 1-10? Poor in every aspect. Not an audio book and not a dramatization. A waste of time and money. Sadly I found the back ground sound effects poorly done. Story and narration was good but spoilt by silly sounds at times. Im not a fan of the added sound effects. Audio was a bit hard to hear in the first few books. But in all its not a bad story .